Place: Please gather at main entrance of Masjid Jamek (near to Masjid Jamek LRT Station). Please wear Black and Red coloured clothes to show your solidarity with Gerakan Mansuhkan ISA (GMI). For more information contact Nalini at 019 3758912 or SUARAM office 03 77843525, or suaram@suaram.net. Barisan Nasional has just scored a world’s first for Malaysia. 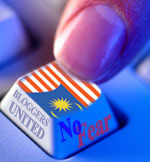 First blogger locked up without trial. The fact that Raja Petra’s 2-year ISA detention order was signed by the Minister of Home Affairs just the night before his habeas corpus hearing this morning, shows Petra’s case is political, and has nothing to do with the waffle that BN has saying. It lends further credence to the fact that putting Petra into Kamunting is not negation of some of the articles and documents published in Malaysia. Otherwise existing laws which allows Petra to have an open trial would have been used. Which makes us ask yet again, a question which everyone knows the answer to by now – who stands to gain in putting a prolific writer in a detention camp?